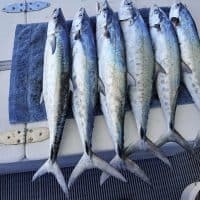 Our charters are the perfect way to experience world-class fishing in a relaxed, comfortable and safe environment. We operate 7 days a week, all year around (weather permitting) so you are sure to find the perfect time slot to suit you and your group. 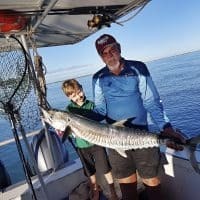 The perfect way for you to get in some truly memorable fishing but without the need to commit to a full day, our half-day charters are an excellent solution. 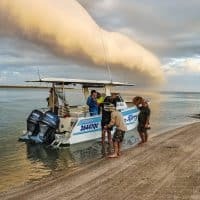 Departure from Karumba Point boat ramp is at either 7 am or 12 pm– this gives you the chance to enjoy up to 5 hours of quality fishing time! Rods, reels, tackle and bait, or you can bring your own if you like. All top quality gear provided and all exceptionally maintained for your peace of mind. You catch it; you keep it! – We store your catch in an icebox until we get back to shore, at which point it’s yours to do with as you please. 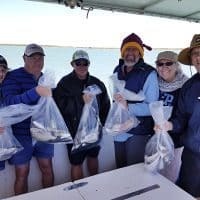 If you are looking for a full day’s fishing on the water that allows you the chance to test your skills, our full-day charters are the perfect solution! We depart from Karumba Point boat ramp at 7 AM, returning at 5 PM. That’s a full day’s fishing! Rods reels tackle and bait, or you can bring your own if you like. All top quality gear provided and all exceptionally maintained for your peace of mind. Lunch provided! – Lunch is provided and can be casually eaten single handed, meaning you don’t have to interrupt your fishing for anything! 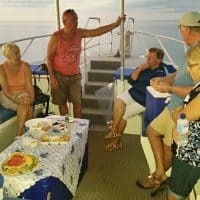 Our sightseeing cruises are the perfect way for you and your family/friends to enjoy a memorable and relaxing sunset evening cruise. Take in some beautiful surroundings and learn the fascinating history of the areas you visit thanks to tour commentary provided by your skipper. Exploring historic waterways has never been so relaxing! Relaxing – Settle back and enjoy some truly beautiful scenery, the like of which all too few ever get to experience. 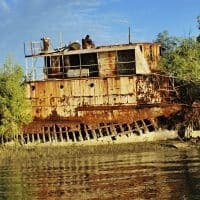 Enlightening – Learn some fascinating local history including a visit to the famous wreck of the Katoora, a large ship blown into the mangroves. Nibbles – Prawns, nibbles, plus fruit and cheese platters. Kerry D are also available for selected private charter. Due to the individual nature of your requirements, we would ask you to contact us with details of what you want so we can help you put something together and provide you with the best advice on how to proceed. 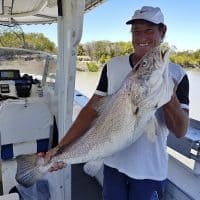 This includes Barramundi Charters (Feb-May) a full-day only charter for a maximum of 4 people, price on application. Please contact us for more details. Soft drinks and water are provided. BYO alcoholic beverages. 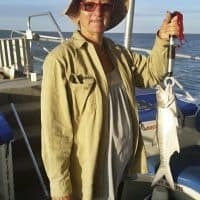 Kerry D Charters are also available for private charters. Due to the individual nature of your requirements, please contact us with details of what you would like so we can help provide you with the best advice.